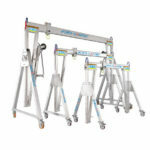 Lightweight, portable and safe, the innovative and unique PORTA-GANTRY Aluminium lifting gantry range is designed for easy transport, rapid assembly and safe use. Protier offers a range of configurations, adjustable height, lift-ratings and personnel lifting options, including the world’s first WLL 5000kg (5 Tonne) capacity portable gantry. Beam lengths of up to 6000mm available. Portable Steel Lifting Gantries offer a cost effective way of lifting heavy loads in areas without cranage. Available in a range of capacities from 500kg to 10,000kg. Protier can manufacture steel gantries to our customers specification complete with trolley and hoist in a range of finishes. 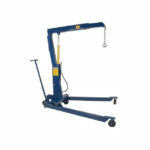 The Protier Counterbalance Floor Crane features adjustable boom that raises and extends allowing it to lift a variety of loads. With capacities of up to 2500kg available. 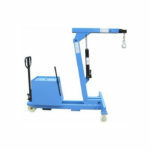 Protiers hydraulic floor crane comes with counter balance weights which eliminate the need for front legs making the crane more maneuverable and allowing it to work in restricted access areas. The boom is raised with a hydraulic hand pump. UK manufactured by Protier, we can offer fully bespoke options including Swivel mast, Electric Control, Out Riggers and much more. 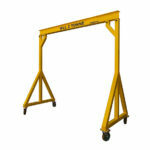 The hydraulically operated floor crane are both versatile and easy to use. Available in a range of sizes and capacities up to 3000kg, they are an essential tool for lifting engines, gearboxes and general machinery movement.